Today I heard a great interview on the radio today with the author of a new biography about Cleopatra that goes back to original sources. Listen to the story here (if you’re in the US — not sure if it works in the UK). Just in case, I have uploaded the mp3 file here. Usually NPR will post interview transcripts within a few days, so keep an eye on it. There is also an excerpt available here. If the name is indelible, the image is blurry. Cleopatra may be one of the most recognizable figures in history but we have little idea of what she actually looked like. Only her coin portraits — issued in her lifetime, and which she likely approved — can be accepted as authentic. We remember her too for the wrong reasons. A capable, clear-eyed sovereign, she knew how to build a fleet, suppress an insurrection, control a currency, alleviate a famine. An eminent Roman general vouched for her grasp of military affairs. Even at a time when women rulers were no rarity she stood out, the sole female of the ancient world to rule alone and to play a role in Western affairs. She was incomparably richer than anyone else in the Mediterranean. And she enjoyed greater prestige than any other woman of her age, as an excitable rival king was reminded when he called, during her stay at his court, for her assassination. (In light of her stature, it could not be done.) Cleopatra descended from a long line of murderers and faithfully upheld the family tradition but was, for her time and place, remarkably well behaved. She nonetheless survives as a wanton temptress, not the last time a genuinely powerful woman has been transmuted into a shamelessly seductive one. Fascinating, right? Based on the interview and the excerpt, I’m definitely going to buy this book. And you can too, right here at Amazon US or Amazon UK! Several weeks ago, researchers announced the discovery of a prehistoric site on the Salisbury Plain near Stonehenge that appears to mirror the structure of the henge. They’re guessing it was a wooden henge that mirrored the original in its layout and orientation, similar to Woodhenge and Bluestonehenge, both stone circles found within two miles of the original. Most excitingly, this discovery came within the first two weeks of the researchers’ three-year landscape survey using new imaging technology, so there’s no telling what other new finds lay on the horizon. To keep us going in the meantime, I’ve put together a list of the best cameos of Stonehenge in films and television programs. To start us off, here’s a little preview of our next film post! Shakespeare’s “King Lear” is drawn from the myth of Leir of Britain, a pre-Roman Celtic ruler. Most productions of the tragedy costume the players in Elizabethan garb, but Laurence Olivier’s 1987 production for the BBC takes the story back to its source. 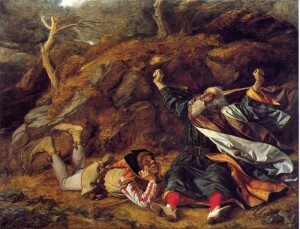 A great deal of the action takes place in and around the Stonehenge monument, not just to place the story in its correct prehistoric setting, but to provide a stable center for the story’s swirling points of chaos: the assumed savagery of life on the misty heath, the king’s life amongst battles and political intrigues, and Lear’s mind as he eventually descends into madness. Doctor Who has often drawn upon various elements of English history and culture to inform its stories, and “The Pandorica Opens” is no exception. In this episode, the monument is surrounded by Roman legionnaires, though it conceals something far older and with deeper implications for the Doctor and his friends. Like Lear, Tess Durbeyfield is a tragic figure. At the conclusion of the Thomas Hardy novel, she and Angel, finally reunited, flee through the misty countryside and come upon Stonehenge. Exhausted by her flight and her trials, Tess rests on a sacrificial alter stone, a victim of the will of the gods or her fatal flaw, neatly tying together the novel’s themes of modern development vs. mankind’s close relationship with the earth, and contemporary religious belief vs. nature-worshipping paganism. The National Lampoon series of films is the American equivalent of the British “Carry On” movies — colorful, goofy, cheeky slapstick comedies. In European Vacation, the Griswold family stumbles awkwardly around England, France, Germany and Italy, causing chaos and insulting the natives at every turn. 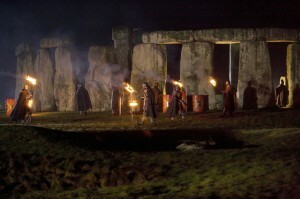 Their visit to Stonehenge goes as well as one might imagine, given the above. Clark Griswold delivers a thoughtful speech about the significance of the venerable rocks and their importance for future generations, before…well, see for yourself. Perhaps the only movie on this list to pay an appropriately epic tribute to the monument, at least in theory, This Is Spinal Tap is a biting, hysterical mockumentary about a fictional British rock/metal band, consisting of four of the least self-aware humans to walk this planet. Night of the Demon: You know that line in the opening of Rocky Horror Picture Show that goes, “Dana Andrews said prunes/Give me the runes”? That’s a reference to this 1957 horror flick. Half Wicker Man, half hard-boiled detective story, this film is one of the more innovative creepy creature features of the era. 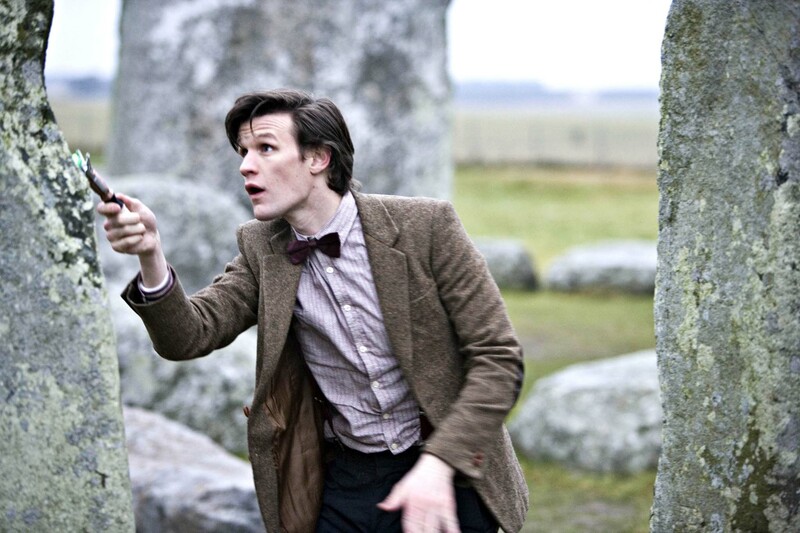 Stonehenge Apocalypse: A made-for-TV movie about all the mysterious ancient monuments of the world…coming to life? Fighting aliens? Not exactly sure on this one. Picking up where the schools left off - by watching movies! We are learning about the whole of British history by watching films sorted into chronological order. In this way, we hope to place history's figures and events into a visual context, for easier understanding and retention. Our comprehension is supplemented by research and reading. We started with Carl Sagan's Cosmos and films about cavemen, and we'll end with movies set in the future (Brazil, if..., A Clockwork Orange, Children of Men). We will also be doing a branch of American history films when we reach that point in the timeline. View our film list and offer us suggestions by commenting or emailing us at lehall-at-gmail-dot-com. Enter your email address to subscribe to Anglofilmia and receive notifications of new posts by email.